The rocky shoreline of what would be Mattapoisett, Massachusetts was settled during the 1750’s and quickly developed into a center for shipbuilding and whaling on Buzzards Bay similar to its nearby neighbor New Bedford. 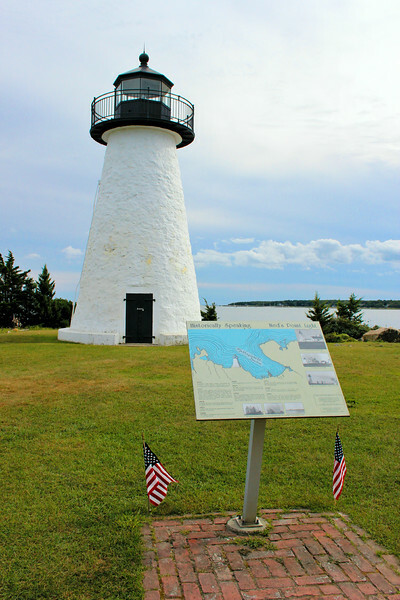 Due to its good harbor, Congressmen (and former President) John Quincy Adams helped push through legislation to build the Ned’s Point Lighthouse. This sentinel has now stood for over 175 years witness to many changes in maritime commerce, but still fulfilling its duty. In March 1837 Congress appropriated a sum of $5,000 for the building of a light station on Buzzards Bay, Massachusetts. Barnabas Hiller sold a four acre plot of land known as “Ned’s Point” at the entrance of a commodious harbor for $240 to the Federal government. The land received its name from a former owner, farmer Edwin “Ned” Dexter.